It's not an impossible demand. It's just that a male tree frog can choose to spend his energy doing one thing or another thing, and females prefer that he does more of both. The best multitasker might be allowed to fertilize her eggs. "The males gather in ponds in the evening and begin to call," says University of Minnesota ecologist Jessica Ward, setting the scene. The species in question is called Cope's gray tree frog. Next, she says, females come to the pond and spend a few minutes listening to nearby males. Then they choose for mates the ones whose calls they find most attractive. What's attractive? 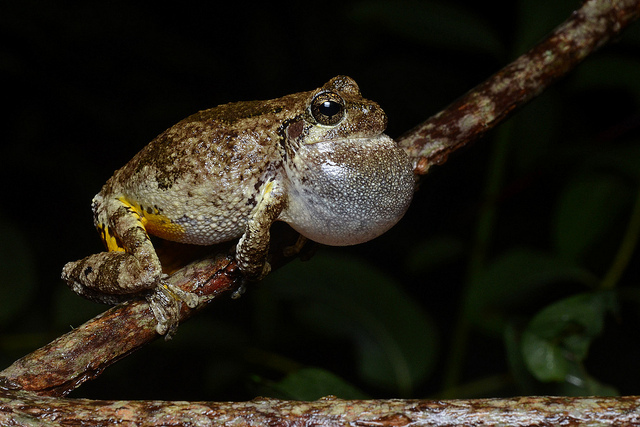 There are a couple of ways a Cope's gray tree frog can make his song stand out from others in a chorus. The frogs can increase the speed of their calls, making more trills per minute. Or they might make each one of those trills last longer. Ward and her colleagues set out to test whether male frogs can only devote energy to one of these factors at a time. And, they asked, are females more attracted to "multitaskers" who can manage both at once? By haunting parks in the middle of the night with recording equipment, the researchers captured a thousand total calls from 50 different frogs. They found that males who called more often made shorter calls, and those who called less often made longer calls. In other words, there's a trade-off: when a frog puts more energy into one aspect of his song, he has to skimp elsewhere. Next, the researchers interrupted male and female frogs that were already clasped together to do the deed and carried them back to the lab. The females were put into sound chambers, where they heard two different male frog songs at a time and could choose one to approach. The artificially generated songs had varying call lengths and speeds. Female frogs, it turned out, preferred the songs that had the best combination of long and frequent calls: the more male effort a song would have required, the more a female liked it. Male frogs, meanwhile, were put into a kind of competition. They sat in a sound chamber and trilled away first on their own, then while hearing the sound of other frogs singing. Males adjusted their own songs when their neighbors were singing at the same time, making each call longer. But they also called less frequently, so the total amount of effort they put into each call stayed the same. Males may already be expending almost all the effort they can to sing, Wade says. She thinks males who can make their calls faster and longer at the same time are somehow more fit than others. A study in a related species showed that frogs who put more effort into their calls were better swimmers, for example. So females may be onto something when they choose the male with the most difficult song to father their eggs. This type of multitasking, where a tradeoff exists between different aspects of an animal's performance, has also been studied in birds. Wade says this is the first multitasking study in frogs. Though it's tempting to imagine humans caught in our own version of this trap—asked to attend to an impossible number of factors at once to be maximally attractive—Wade thinks of a different species next. "The multitasking hypothesis may also apply to some spiders," she says.